I think my favorite season may be the one coming up next, unless the next season up is winter. If winter could start December 15 and end December 31, I'd be good with that! It's been a hot, dry summer here in Michigan, so I'm looking forward to fall and a break in the heat. I've also been looking forward to squash, specifically spaghetti squash. Since going gluten-free last December, I've been missing pasta (among other things) but then I discovered spaghetti squash. The first time I made spaghetti using spaghetti squash I "neglected" to mention to my husband that he was eating a vegetable rather than pasta, and he didn't even notice! That's quite a testimony coming from someone who's not a fan of vegetables! The squash I found at the store were on the small side, so I purchased two totalling 3.75 pounds. One, just under two pounds, was actually enough for both of us but we like leftovers so I made them both at once. 1. Cut squash in half. 3. Bake at 350 degrees F for 45 minutes. 4. Remove strands with a fork. Since I'm watching my grandsons, ages 2 months and 15 months, I don't always have a lot of time for prep (or anything else for that matter) so I opted to cook the squash in the microwave. There are several different methods I found online, but the one I like best does not require you to remove the seeds before cooking. 2. Puncture with a knife. (You want the punctures to be deep so the steam will escape and the squash doesn't explode!) You need at least 5 punctures, but I put a puncture about every inch-and-a-half; the more punctures, the less cooking time. 4. Remove from microwave and cool 3 to 4 minutes or until the squash is cool enough to handle. 5. Cut squash in half and remove seeds with a large spoon. Now that you have your spaghetti, top however you would pasta, and viola! 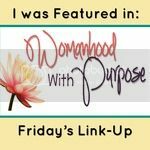 Linking up with "Better Mom Mondays", "Teach Me Tuesday", "Live, Laugh, Rowe", "Weekend Whatever", "Funky Junk Interiors", "Mrs Happy Homemaker"
What a BUSY day! I'd be exhausted! Thanks for stopping by my blog today. Your header has my favorite verse on it! Hi, Lisa! 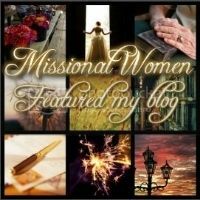 Just found your blog from Creative Christian Mama. So funny because I cooked a spaghetti squash in the microwave last night!!! I wasn't sure it was going to work and was very happy with the results. I cut mine in 1/2 and layed it cut side down on a plate. Ate it with my homemade spaghetti sauce. Yum! I just went grain free in July and am always looking for recipes and such. Thanks!! !